Telltale's reboot of the classic adventure franchise dissolves as Activision reclaims the game's rights. 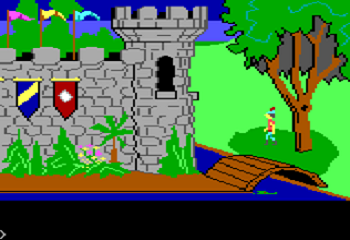 King's Quest is one of the oldest and most revered adventure franchises in gaming, spanning eight titles released across fourteen years. In 2011, Telltale Games revealed that it had purchased the rights to the franchise from Activision, and intended to revive it with a reboot of the series. This announcement was followed by a whole lot of not much happening. Whatever ambitions Telltale had for King's Quest never seemed to materialize, and it now seems they never will. After two years of inactivity, the rights for King's Quest have been returned to Activision. "While we deeply love King's Quest here at Telltale, we can confirm that we are no longer working on the franchise," said Steve Allison, Senior VP of Publishing at Telltale Games. "There was a time last year that we investigated partnering with third party developers to produce the game as a partnership but decided against outsourcing. We are not privy to what plans Activision has for the franchise, if any." The potential partner in question was Paul Trowe and Replay Games. Trowe, who successfully Kickstarted a remake of Leisure Suit Larry in the Land of the Lounge Lizards in 2012, had spoken to Telltale about working with them on a new King's Quest. "[Telltale] had it, and we were going to license it from them to make the remakes," said Trowe. Despite these talks, Telltale opted against outsourcing, a move that current Activision now seems to be mimicking. "I talked to the guys at Activision and they were like, 'No, we're pulling it because we're going to do it ourselves.'" Neither Trowe or Telltale know exactly what Activision might do with King's Quest going forward. According to Trowe, the reason behind Telltale's lack of progress with King's Quest stems from not having enough resources due to its development of projects. With its work on The Walking Dead and the launch of Fables: The Wolf Among Us on the horizon, the developer was simply spread too thin.